We can recognise Level Zero as RPC, or SOAP style APIs. Level One APIs have the concept of resources (or representations), but all requests use one HTTP method (such as GET or POST). This fails to leverage the HTTP protocol to its fullest, and as Richardson notes, makes it very easy to destroy data by accident. Level Two is probably the commonest level seen in production APIs today. 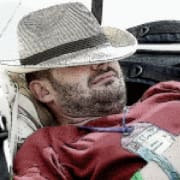 It represents all of Fielding's mandatory REST constraints apart from HATEOAS. 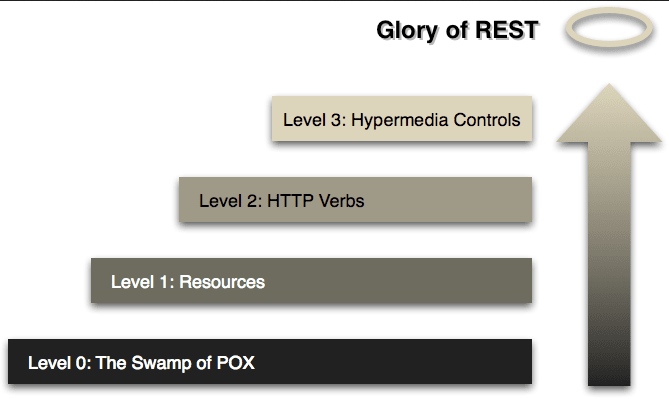 "A lot of people settle for level two because hypermedia is difficult to understand and its value in the web service domain isn't as clear." Even if we accept the application of a maturity model to API design as being somewhat biased, implying as it does that REST APIs are more "mature" than RPC APIs (when in fact they simply serve different needs and purposes), there is little excuse for using pejorative terms like "swamp". "POX" also sounds unpleasant, but here simply means 'Plain Old XML'. Either way, the popularised version of the RMM makes no distinction between resources and representations and only adds to the confusion between HTTP 'verbs' and HTTP methods, which the original does not. Do please refer to Richardson's original work for more details on this model. Thanks to Darrel Miller for pointing out Richardson's later talk. Wait, but what's the problem. You said it doesn't exist, and then went on to explain to explain that it does exist and what it does. "The Richardson Maturity Model" isn't what it's called by the person who invented it. Who now basically wishes he hadn't. Even the person who popularised it apparently (I now learn) has changed his mind about it. The article is an 'excuse' to go back to basics and see where the idea originated and whether we should still be referencing it.